Slope is a key part of linear equations, revealing not only how steep a line is but also which direction it travels. Lines with a positive slope move up and to the right on a graph, while lines with a negative slope travel down and to the right. There are occasions when a line has neither a positive or negative slope, however; in these instances, the line is sometimes referred to as having "zero" slope. What does this mean, though? Essentially, it means that the line only travels in one direction on the graph instead of moving along both the x and y axis. A line with zero slope remains parallel to the x axis. If the line is parallel to the y axis instead, the slope is typically referred to as "infinite" or "undefined." The slope of a line is defined as its rise (the amount that it travels up or down on a graph as it moves from point to point) divided by its run (the amount that it travels left to right between those same two points). If the slope of the line doesn't travel up or down, however, the slope ends up being zero divided by the run of the line. As zero divided by any number is still zero, the overall slope of the line ends up being zero itself. This means that the line has no slope, and instead appears as a straight line with no positive or negative shift regardless of how far you follow it in either direction. Zero-slope lines are easy to graph on a two-dimensional plane. Using the standard linear equation of y = mx + b, you can eliminate the x entirely once the slope is entered into the equation as it becomes y = 0x + b, and anything multiplied by zero is zero itself. This leaves you with y = b, meaning that the entire line is defined by the point where it crosses the y axis. Once you've defined the y intercept, draw a straight line that is horizontal to the x axis and that crosses the y axis at the appropriate point. As an example, assume that you have a line with a zero slope that crosses the y axis at the point (0,6). When you put the slope and the y intercept into the linear equation, you end up with y = 0x + 6, which can then be simplified to y = 6. To graph this, locate 6 on the y axis and draw a horizontal line across the graph at that point. Similar to the concept of zero-slope lines is the "undefined" or "infinite" line. These lines don't cross the y axis at all; instead, they cross the x axis at a single point and remain parallel to the y axis along their entire length. Just as zero-slope lines have no rise, undefined lines have no run; they don't travel left to right at all. This is actually why they're referred to as "undefined", as trying to enter them into the slope equation results in division by zero (since run is the denominator in the slope formula). Since you can't divide by zero, you're left with a slope that doesn't have a definition. 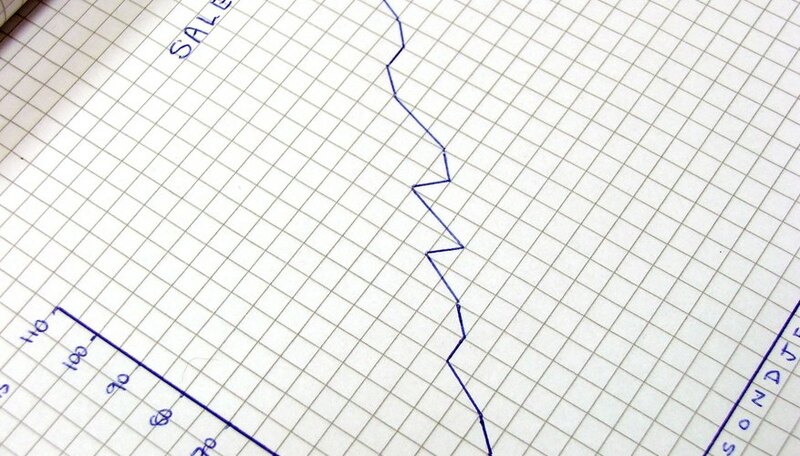 It may seem odd to think about graphing an undefined slope. After all, if there's no definition, then what is there to graph? From a practical standpoint, however, a line with an undefined slope is simply a line that travels up and down the graph parallel to the y axis. To graph one of these lines, find the x intercept and draw a straight vertical line. There is no y intercept as the line never crosses the y axis. If you take the previous example of a slopeless line and change the intercept point to (6,0) instead, the standard linear equation falls apart as there's no slope and no y intercept to graph from. Instead, you define the line by its x-intercept value and graph it as x = 6. This creates a vertical line that crosses the x axis at 6 and doesn't cross the y axis at all. What Are the Subsets of a Line in Geometry? Gerard, Jack. "What is Zero Slope?" Sciencing, https://sciencing.com/what-is-zero-slope-13712206.html. 16 May 2018.